Nigel Cox was born in 1951 in Pahiatua and grew up in Masterton and the Hutt Valley. His early working life reads like an author trying to find his way: advertising account executive, assembly line worker at Ford, deck hand, coalman, door-to-door turkey salesman, driver. Eventually, in the UK, he found his way into the book world – he worked for many years as a bookseller, with later stints at Unity Books, Wellington and Auckland, and as a freelance writer. In 1995 he became Senior Writer on the team that developed the exhibitions for Te Papa Tongarewa, New Zealand's national museum. With fellow New Zealander Ken Gorbey he led the project team that created the Jewish Museum Berlin, housed in the famous building designed by Daniel Libeskind. After the museum opened in September 2001 he joined its staff as Head of Exhibitions and Education. Nigel’s published novels include Waiting for Einstein (1984), Dirty Work (1987), Skylark Lounge (2000) and Tarzan Presley, released in 2004 to rave reviews from readers and critics. It was named a runner-up in the Fiction category of the 2005 Montana New Zealand Book Awards. Responsibility, Nigel's fifth novel, was published in May 2005 to widespread critical acclaim and was runner-up for Fiction in the 2006 Montana New Zealand Book Awards. His sixth novel, The Cowboy Dog, (Nov 2006) was named as one of the Listener’s Best of the Best for 2006 and was runner-up in the Montana New Zealand Book Awards 2007. He was the 1999 Katherine Mansfield Fellow in Menton. In 2000 he and his family moved to Berlin but they returned to New Zealand permanently in 2005 and he rejoined Te Papa as Director – Experience until May 2006. Nigel was diagnosed with terminal cancer in late 2005 and continued to write. In an interview by Guy Somerset in the Dominion Post 24 June 2006 Nigel talked candidly about his life, his illness and his work. Nigel died on Friday 28 July 2006. He is survived by his wife Susanna Andrew and their three children, Kate, Andrew-Jack and Frank. The Cowboy Dog was published posthumously by VUP in November 2006. 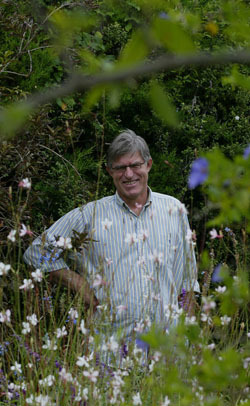 Nigel Cox, who died on 28 July after a long illness, was one of New Zealand’s finest writers. His novels opened up a space in New Zealand literature which hadn’t existed before, a space in which a recognisable New Zealand reality is illuminated by a mythic dimension drawn from twentieth-century popular culture. He was also an outstanding bookseller and museum manager. Nigel was born in Pahiatua in 1951, the son of Jack and Delphine and older brother of Debbie. He grew up in the Wairarapa, an environment which is memorably evoked in part one of his novel Tarzan Presley. In 1962, Jack received a Fulbright Exchange Teaching Fellowship and the family lived in California for a year which was hugely influential on Nigel’s life and books. When they returned to New Zealand and settled in Lower Hutt, a mixture of culture shock and misguided subject-choice led to Nigel’s spending three years in the sixth form at Hutt Valley High. In these years his true loves were music and hockey. Hockey eventually gave way to tennis, and he was a keen and competitive player till near the end of his life. Rock star dreams ended when the high-school band split, but what he termed “the extraordinary potency of cheap music” became one of the key themes of his life and books. Nigel’s early working life reads like that of an author trying to find his way: advertising account executive, assembly line worker at Ford, deck hand, coalman, door-to-door turkey salesman, driver. It was the 1970s, and he spent some time on the hippy trail, including several months living on a beach in Greece. In Britain there was a first, short-lived marriage, and eventually work in the book world. After returning to New Zealand, Nigel worked as a bookseller. He was for a time manager of The Book Corner in Auckland, and in 1982 began his long association with Unity Books. With owner Alan Preston and co-manager Jo McColl (then Harris), Nigel made Unity a major part of the Wellington literary community. A key moment was Unity’s passionate early promotion of The Bone People from their small 42 Willis St shop. Later, the larger Perretts Corner shop was the venue for many launches and readings. In 1989 Nigel and Jo opened a second branch of Unity Books at 19 High St, Auckland, and it became an equally significant part of the Auckland scene. It was there that he met Susanna Andrew, whom he would marry. Throughout his bookselling career, Nigel was a generous and provocative advocate for New Zealand writing. He always insisted, however, that the interests of readers came first, and he remained resolutely independent of publishers’ hype. He also frequently went into battle on readers’ behalf with publishers who sought to enforce their territorial rights over international books that they supplied slowly and reluctantly. Nigel always thought of himself first and foremost as a writer. Three early novels were deemed by him to be unpublishable. His first book, Waiting for Einstein (Benton Ross, 1984), was warmly received, but it was Dirty Work (1987) that seemed to signal a major career. It was shortlisted for both the New Zealand Book Awards and the Wattie Book of the Year, won the Buckland Literary Award, and led to the award of the Katherine Mansfield Memorial Fellowship in 1991. The novel that Nigel wrote in Menton didn’t meet his own high standards, however, and was never offered to a publisher. During the thirteen-year silence which ensued he never stopped writing, but nothing was ever good enough. In 1995 Nigel returned to Wellington to take up a position as senior writer for the Museum of New Zealand Te Papa Tongarewa, and thus embarked on an unlikely stellar career in museum management. In 2000 he went with fellow New Zealander Ken Gorbey to lead the project team that created the Jewish Museum Berlin, housed in the famous building designed by Daniel Libeskind. After the museum opened in September 2001 he joined its staff and was Head of Exhibitions and Education until he returned to New Zealand in April 2005. In September he rejoined Te Papa, and was Director Experience until May 2006. Nigel never did anything by halves, and disliked anyone speaking of his museum work as just a day job. He gave it everything, and took great pride in his contributions to both Te Papa and the JMB. In 1997, Nigel was diagnosed with a secondary melanoma. During treatment, a nurse told him that if there was anything he really wanted to do he should do it now, and he went home and resumed his routine of getting up at 5am to write, then making the family breakfast and going off to a full day’s work. The result was Skylark Lounge (Victoria University Press, 2000), a novel in which the central character is kidnapped by aliens who speak to him through Dusty Springfield songs. Damien Wilkins described it as a book about cancer, in a “brilliant, lovely, roundabout way”. Nigel thought it was his best book. In Germany Nigel completed Tarzan Presley, an extraordinary book in which Tarzan is raised by the gorillas who live in the Wairarapa hills, then is taken by the beautiful young zoologist Jane to the United States, where he’s adopted by Gladys Presley. Eventually, disgusted by the excesses of the rock ‘n’ roll lifestyle, Tarzan Presley fakes his own death and lives out a happy anonymous retirement in Australia. Why Australia? Nigel never had a good answer, but he said the book was close to autobiography. For a while Tarzan Presley looked set to be an international sensation, but the rapturous enthusiasm of overseas publishers would always suddenly and mysteriously cool. When it was published in New Zealand in 2004 by Victoria University Press, it was suppressed by the Edgar Rice Burroughs Corporation. Nigel thought that this was an outrage, and looked forward to the day when international intellectual property law returned to a better balance between individual property rights and the public good, and Tarzan Presley could live again. In late 2005 Nigel was found to have system melanoma. With characteristic dedication, he continued to work at Te Papa as long as he possibly could, and, incredibly, finished a new novel, The Cowboy Dog, early in July. His last public act was to attend the Montana New Zealand Book Awards in Auckland on 24 July. Responsibility was a runner-up, and his beautiful and eloquent speech was met with a standing ovation. Nigel was farewelled on 31 July, first at Te Papa and then with a service at St Joseph’s Catholic Church. Nigel is survived by his wife, Susanna Andrew, and three children, Kate, Andrew-Jack and Frank. Nigel Cox—novelist, museum innovator, bookseller, friend, family man—led an inspiring life. His ongoing and cumulative influence on those who knew him, and on the intellectual life of the nation, will be immense. He will be sadly missed.